Although there is hardly any change at the top of the chart, the players in the lower division are making impressive improvements. An outstanding result for HP Services as analysts’ interest heats up and ranks HP Services at the 10th position. Moreover slowly but surely Unisys, IBM, Deloitte and Bearing Point all move up by one position in the diagram. On the contrary Capgemini and Wipro show decline in analyst focus and slide down the scale. 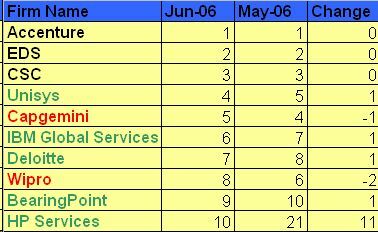 Glancing at the top 25 as a whole (which is available on request, just email us at the address below), the unfortunate ones for the month of June are HCL sliding from the 13th to the 18th position, Tata Consultancy and Verisign both stepping down by 4 echelons. New entrant in the top 25 league of Lighthouse Services Index is BT Global Services and the firm that dropped out is Fujitsu Services. If you wish to be sent the top 25 Lighthouse Services Index each month please send an email to analysts [at] lighthousear dot com.